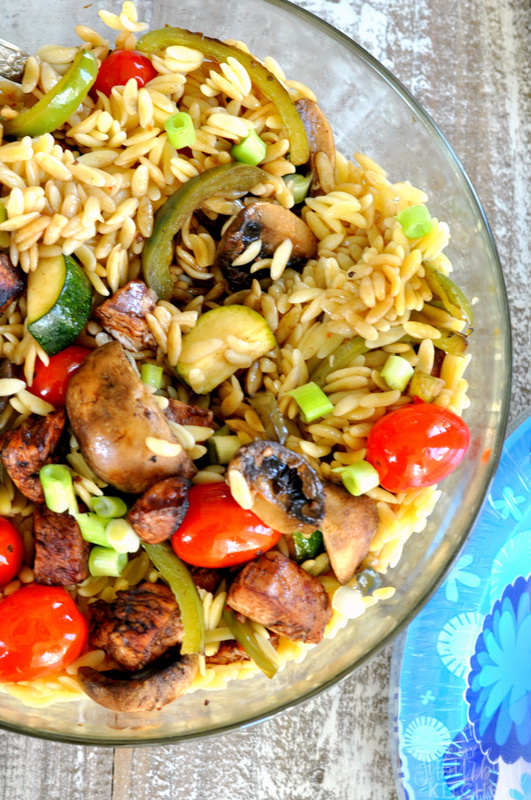 Grilled Balsamic Chicken and Vegetable Orzo is the perfect recipe to feed a crowd! The balsamic vinegar is great paired with the grilled meat and veggies! 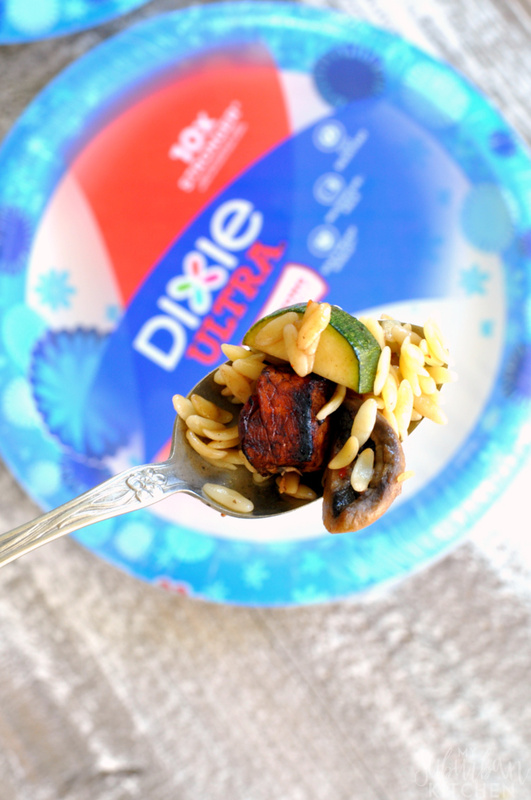 This balsamic grilled chicken and orzo pasta is perfect for weekly meal prepping! Once the weather turns warm, there is nothing more perfect for dinner than grilled meat and vegetables. This Grilled Balsamic Chicken and Vegetable Orzo is perfect for a summer meal on the patio, to use for weekly meal prep, or to take to the neighborhood potluck. I used two grill baskets to cook my chicken and vegetables on the grill since I had chopped everything at the start. If you want to skip the grill baskets, leave your chicken breast whole and use skewers for the vegetables. We love this grilled balsamic chicken and vegetables so much that I make it even during the winter. I just use a grill pan or even just a large saute pan. The key is making sure you still marinate the meat before cooking though. Marinating the meat makes a big difference with flavor! If you can leave it to marinate for a few hours that’s even better, but 15 minutes will do just fine if you’re short on time! I have served this all mixed together or with everything separate allowing guests to get as much or as little of each item as they want. The result is always the same: huge smiles and full stomachs. 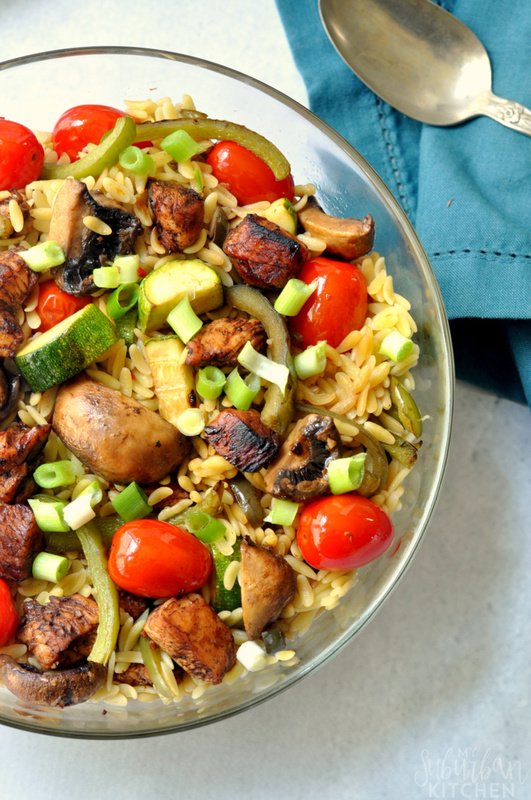 If you make this grilled balsamic chicken and vegetable orzo or any other recipe for the blog, I’d love to know about. Let me know in the comments or snap a photo and tag it #MySuburbanKitchen on Instagram or Twitter. 1. In a small bowl, whisk together balsamic vinegar, Italian dressing and garlic. Reserve 1/3 cup marinade. Combine remaining marinade with chicken breast pieces in a bowl and marinate for 15 minutes. 2. Meanwhile, heat grill to medium heat. 3. Toss tomatoes, mushrooms, peppers and zucchini with olive oil. Season with salt and pepper. Add tomatoes and peppers to grill basket and place on grill. Cook, shaking frequently, for 5 minutes. Add mushrooms and zucchini to grill basket. Brush with some of reserved marinade and cook for another 5-7 minutes. 4. Remove chicken from marinade and add chicken to separate grill basket (or wait for vegetables to cook). Cook for 7-9 minutes, or until fully cooked. 5. 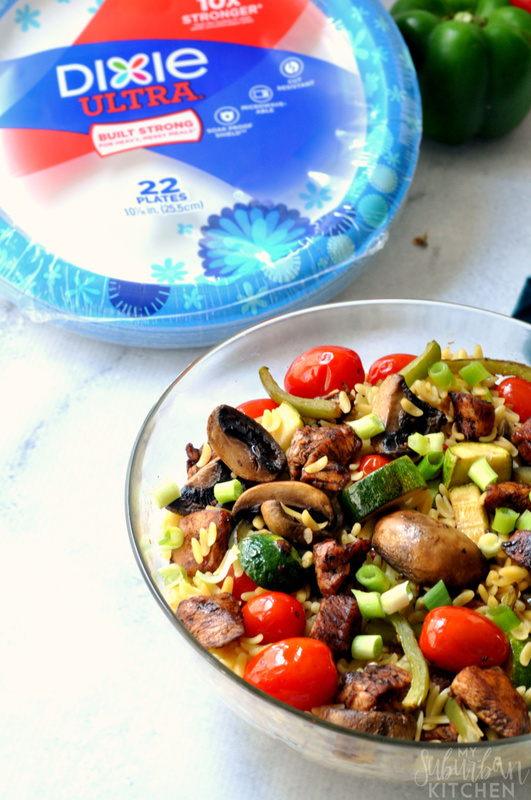 Toss together chicken, grilled vegetables and orzo. Drizzle with 2 Tbsp reserved marinade. Serve warm or cold. Gonna do this for one of my meal preps this week! Definitely a keeper! Easy and it’s great cold, which we love for meal prep because we can just grab and go. Thanks!